Accordion-like folds curve toward downtown Kansas City, Missouri — now a staple of city’s skyline. We’re talking about the Kauffman Center for Performing Arts. You can’t ignore its towering structure driving along Interstate 35. Her query struck a chord. How did the architects decide on that design for Kansas City’s unmistakable performing arts center? And why? Let’s peek behind the curtain to reveal the backstory of this Kansas City landmark. The idea for a performing arts center began in 1994 – first sketched on a napkin. Muriel McBrien Kauffman, a Kansas City-area philanthropist, created a foundation and shared her vision for a center for the arts with her family and the community. But her daughter Julia brought the vision to life after her mother’s death. Supporters hailed the $413-million project as a game-changer for the city, its landscape and area performers. It took nearly eight years to get the idea to the planning stage. In 2002, the center’s board chose a team: well-known architect, Moshe Safdie; theater designer, Richard Pilbrow and acoustician, Yasu Toyota. As Safdie Architects wrote, “performing arts centers are as good as their acoustics, as good as their sight lines.” They achieved both. The location was already ideal; the Kauffman Foundation had purchased land nestled between the Crossroads Arts District and downtown. Proximity. Convenience. Buzz. It had it all. But the design made it stand apart from the crowd. “You might say that if within the auditorium an opera is performed within a set on the stage, then the building itself is a set for playing out the ritual of public life in the city,” a Safdie Architects’ description of the project reads. The south-facing entrance allows visitors to look toward the horizon. The risk, the team admitted, was having the building “turn its back” on downtown and the central business district. So, designers created a building that shone from all angles, which resulted in a curved, almost reflective, exterior that bellowed from 17th Street. Inside, those curves sweep upward and envelop the audience. The building mirrors the city with its stainless steel exterior, a marriage of form and function. 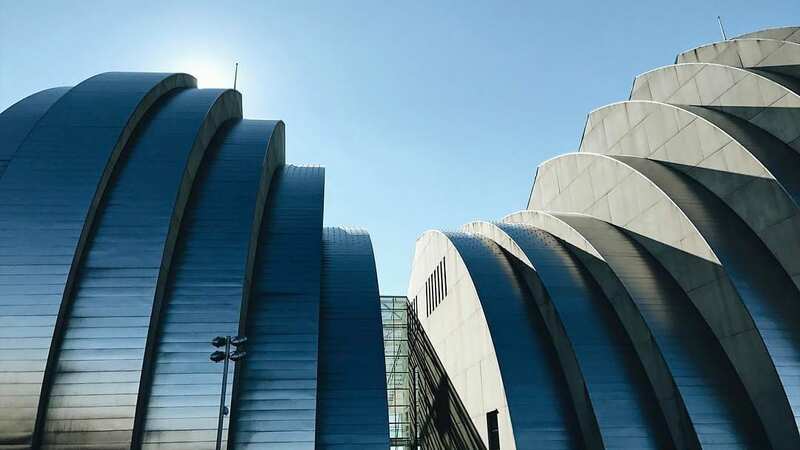 Part of why the Kauffman Center has its curved shape is for the acoustics in its performance halls, Muriel McBrien Kauffman Theatre, Helzberg Hall and Brandmeyer Great Hall. The other reason – sight lines that onlookers or visitors can see inside and out. So, as you can see, this question is anything but elementary.